Western “colonial” states are not interested in S. Africa’s development, but rather want to take its natural resources and never give anything back, Jacob Zuma, S. African president, told RT. It’s China’s investment that Zuma sees as a way to prosperity. “The Western world or the European countries, in particular, came to Africa [in the 19th century] to colonize and they had been taking the resources of Africa,” Zuma said. But even after the continent decolonized itself in the mid-20th century, its relationship with the US, UK, France and other Western countries “remained the same,” he stressed. “They still regard us as the Third World, as a kind of people, who must be related to as the former subject [state], etc. That talks also to the economics… Their intention has never been to make the former colonial countries develop,” the president explained. “The Chinese come differently. They come to do business with us. They are ready to help… The results would be that African countries will be empowered,” he said. China is educating African students and building highways in many countries, while the Western states “only built roads from mining areas to harbors,” the president added. China is currently South Africa’s top trading partner, and Zuma expressed confidence that recent attacks on foreigners, in which Chinese citizens were affected, won’t lead to a cool down in relations between Pretoria and Beijing. “The issue of xenophobia was exaggerated in South Africa,” he said, adding that the true reasons for the attacks lay outside racial issues. The South African leader pointed out that thousands across the country had taken to the streets to protest xenophobia after five people died in violence in Durban in mid-April. Despite “some things here and there,” South Africa was one of only two African nations approved as one of the 57 founding members of the Chinese-led Asian Infrastructure Investment Bank (AIIB). Beijing and Pretoria will also join efforts to establish the BRICS bank (New Development Bank), with South Africa set to host the new financial institution’s regional center. The countries comprising the BRICS group are Brazil, Russia, India, China and South Africa. 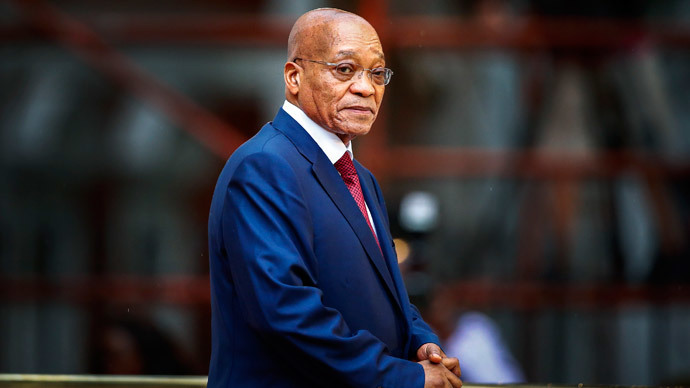 Zuma criticized existing international financial institutions, such as the International Monetary Fund and the International Bank for Reconstruction and Development, saying that “it’s very difficult to pinpoint the real exemplary kind of delivery by these institutions,” and that African countries “got into more difficulties” by relying on their assistance. The idea of the New Development Bank has “brought the fresh breath in the system,” he said. “BRICS has brought the bank, which is a developer; which is going to operate differently… It’s focusing on the Third World, not just on the Third World, but whomever else. And it’s actually aimed at helping to uplift countries that need help,” the president said. Meeting with Zuma, Russian President Vladimir Putin advocated BRICS development as a vehicle for improving the economies of Russia and South Africa. Zuma arrived in Moscow on Vladimir Putin’s invitation as guest at the May 9 military parade dedicated to the 70th anniversary of Victory over Nazi Germany.